Melvin E. Matthews Sr. (Mellie), son of the late Henry Powell and Lucille Matthews, was born on May 6, 1968, in Wilmington, Delaware. He went home to be with the Lord on August 3, 2016, at the Christiana Hospital surrounded by family and his pastor. Melvin received his education in the Christina School District. He worked at Piane Caterers for many years where he established life-long friends. Later he worked for Hanover Presbyterian Church for 22 years as the sexton until his death. Melvin enjoyed throwing boxing parties when his favorite boxer Floyd Mayweather fought, and having barbecues for his family and friends. He loved watching his TV court shows after work. His favorite was Judge Judy. Melvin loved to spend time with his family; taking trips on Saturdays to Boothwyn Farmers Market. Melvin loved to cut hair (he was everyone’s favorite barber). He loved to listen to music. His pick of choice was Usher, J. Holiday, and Nas. 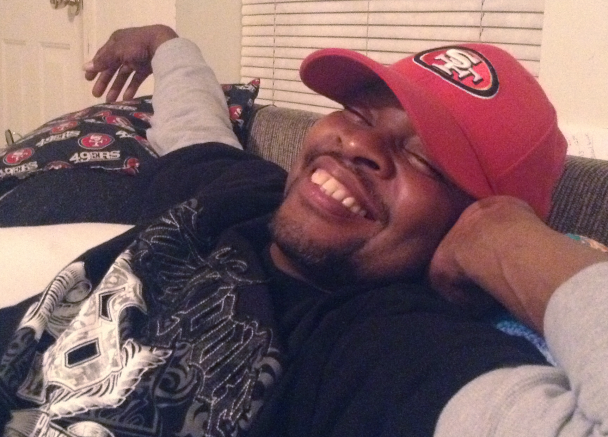 And if you knew anything about Melvin, you knew his favorite football team was the San Francisco 49ers. He collected anything 49ers. He was a kind, sincere and devoted man whose smiling face brought joy to those he touched. He had a big heart and he loved to help anyone in need. He was preceded in death by his brother Dartania Matthews. He leaves to cherish his memory: his wife of 22 years, Jerri Harmon Matthews; his children, Melvin Jr., Porshay, and Sharay Matthews; sisters Rita Smith (Perry), Cynthia and Crystal Matthews and Stephanie Fuller; brothers Vaughn and Jarret Matthews; sister-in-law Janine Watson (Leroy) and god-son Byshi Watson, and a host of nieces, nephews, and other relatives and devoted friends. Services were held at Hanover on August 9, at 11:00 a.m.
Click here to listen to Pastor Andy’s eulogy.